The United States is under siege from invaders . . . from planet Earth! Plant and animal species alien to our ecosystem are spreading at ever-increasing rates throughout the land. One such invader is a new alien insect pest. In July 1998, this insect was collected from a hibiscus plant in Bradenton, Florida. Since then, a team of Agricultural Research Service entomologists has identified the pest, searched its country of origin, collected samples of its natural enemies, and studied them to see whether they can control the pest here. As usual, when a new or unidentified insect is discovered, it is first sent to USDA entomologists at the ARS Systematic Entomology Laboratory (SEL) in Beltsville, Maryland. There, experts on all the known insects are asked to identify and classify the specimen's genus and species. Then they determine whether the insect is new or already living in the United States. SEL entomologist Douglass R. Miller is the ARS expert on scale insects, a family that includes mealybugs. He confirmed what entomologist Avas B. Hamon at the Florida Department of Agriculture and Consumer Services in Gainesville had suspected: The mystery insect is Paracoccus marginatus—the papaya mealybug. masses on a stem of a red potato sprout. "The Bradenton sample was the first time the insect was found in the continental United States," Miller says. "The papaya mealybug is considered to be a serious pest of papaya in several of the Caribbean islands," he adds. "The species has also been reported to cause damage to papaya and cassava in Mexico." Miller's research provided USDA's Animal and Plant Health Inspection Service (APHIS) details on the pest's hosts and distribution, as well as on how to identify and distinguish it from other scale species. 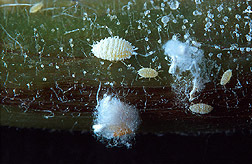 "The adult female mealybug is 1/16th inch long and greenish yellow. Her eggs are the same color and are laid in an egg sac that is 3 or 4 times the length of her body, which is entirely covered with white wax," says Miller. "There's still a lot to be learned about the pest." On papaya, mealybugs damage the plant by sucking its juices and excreting a clear, gooey substance called honeydew. They become so abundant that their bodies and wax color the fruit white, making the papaya unsalable. Entomologists Michael Schauff (left) and Douglass Miller of the Systematic Entomology Laboratory examine specimens and drawings to better understand traits for identifying papaya mealybug. Since its first detection in the Carribbean in 1994, the mealybug has rapidly spread throughout the islands. It is now established there, as well as in Belize, Costa Rica, Guatemala, and Mexico. Miller believes the scale is a native of Mexico or Central America. 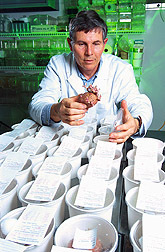 Because the species has been discovered recently in the United States and because authorities on several Caribbean islands have asked for assistance in controlling this pest, APHIS biological control specialist Dale E. Meyerdirk has begun to investigate the possibility of finding natural enemies to serve as biological control agents. Last June, APHIS sent Miller to Mexico, where he spent 10 grueling days traveling nearly 3,000 miles in search of parasites. "Actual collecting began on June 2 on the east coast near Veracruz and ended on June 10 on the west coast near Colima and Uruapan," he says. "We had little difficulty finding populations of the mealybug." Miller and Mexican colleagues entomologist Juan Antonio Villaneuva (Colegio de Postgraduados, Veracruz) and entomologist Héctor González (Colegio de Postgraduados, Texcoco) collected 40 samples of parasites. They included three wasps with potential as biocontrol agents. Miller also asked his ARS colleague and parasitic wasp expert, entomologist Michael E. Schauff at the SEL in Washington, D.C., to identify and classify the wasps and other potential parasites in the 40 samples. 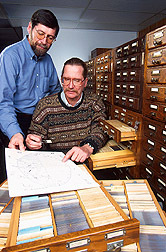 Schauff, along with many other ARS insect experts, works at the U.S. National Museum of Natural History, where the national collection of insects is housed. He, in turn, requested the help of the world expert on these parasites, British entomologist John S. Noyes at the Natural History Museum in London, England. A tiny, 1/32nd-inch-long yellow wasp in the genus Acerophagus, which attacks very young mealybug nymphs and lays one egg in each. It was the most common parasite found in the 40 samples. A 1/8th-inch-long yellow and brown wasp with black markings on its antenna, in the genus Anagyrus. It attacks larger nymphs and adult mealybugs, laying one egg in each nymph. Members of this genus are known to be effective biocontrol agents. A 1/16th-inch-long black wasp in the genus Apoanagyrus. It attacks large nymphs after 3 to 5 days. "All three are from the same family," says Schauff. "Some may be new to science. But all three cause the mealybug to mummify and blow up like a cigar, killing it. And they all may play a role in controlling the papaya mealybug." "Besides wasps, we observed a diversity of natural enemies that included lady beetles, hover flies, and lacewings," Miller says. "In several instances, the lady beetles and lacewings apparently had a significant impact on mealybug populations—especially when populations were high. However, we decided to concentrate our efforts on the wasps. "We collected as many mummies—parasitized mealybugs that had turned brown—as possible, since we knew that they contained wasps. We were encouraged by the potential of these wasps as biological control agents," says Miller, "since they were present even when the density of the mealybugs was low." Several months before his trip started, Miller contacted ARS entomologist Lawrence R. Ertle in the ARS Beneficial Insects Research Unit at Newark, Delaware. Ertle is one of three entomologists there who conduct laboratory and field tests on parasites and predators of problem insects. The scientists import beneficial insects into the United States with a view toward establishing them in areas where insect pests are abundant. Once he had collected parasites and potential biological control agents of the papaya mealybug, Miller sent live samples by overnight mail to Ertle at the Newark quarantine facility, where the parasites could be reared. In preparation for receiving the parasites from Mexico, Ertle established a colony of papaya mealybugs on potato sprouts. "We've been mass-rearing mealybugs for several months in anticipation of screening any potential biocontrol agents that Miller might find," he says. "The collected cultures arrived safely," says Ertle, who has observed several different parasites emerging from the Mexican material. "The small, yellow wasps are fairly abundant. We've seen them parasitize the smaller, immature stages of the mealybug and probe the adults." Now, Ertle is screening and studying the life cycle of these potential parasites in living cultures. He is awaiting APHIS' approval to ship populations of the wasps to St. Thomas, in the U.S. Virgin Islands, where they will be released by APHIS in papaya fields for monitoring and studying their behavior. Miller says that Ertle "also found six hyperparasites—parasites of parasites—all small wasps that Schauff will eventually identify. These parasites feed on beneficial wasps and interfere with effective biological control. The hyperparasites must be eliminated from the cultures kept by Ertle before they are sent to St. Thomas." Ertle says he will have more information on all these biocontrol agents soon. For the present, Florida state officials are encouraging residents to fight infestations with a ladybug nicknamed the "mealybug destroyer." However, Miller says that, based on past experience, the best control will likely be to introduce wasps as natural parasites of the pest. "If parasites cannot be located to effectively control this scale pest, then it might be worthwhile to investigate insect predators of the mealybug," says Miller. "In many instances, these predators were quite common and appeared to have a significant impact on mealybug populations. "—By Hank Becker, Agricultural Research Service Information Staff. This research is part of Crop Protection and Quarantine, an ARS National Program (#304) described on the World Wide Web at http://www.nps.ars.usda.gov/programs/cppvs.htm. Douglass R. Miller and Michael E. Schauff are at the USDA-ARS Systematic Entomology Laboratory, 10300 Baltimore Blvd., Bldg. 005, Room 133, Beltsville, MD 20705; phone (301) 504-5895/5182, fax (301) 504-6482. "Three Imported Wasps May Curb Scale Pest" was published in the May 2000 issue of Agricultural Research magazine.